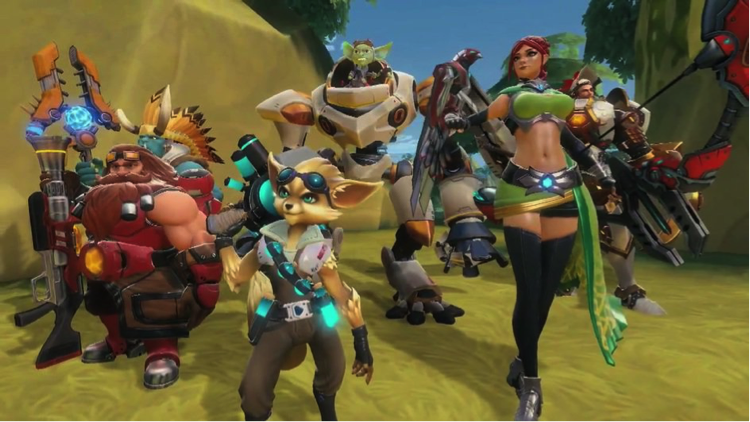 Reviewing "Paladins: Champions of the Realm" Reviewing "Paladins: Champions of the Realm"
Just when you’d lost all hope for multiplayer gaming. In the wasteland that is online gaming, finding something that critics of online play will enjoy can be difficult, and it’s not hard to see why. Between all the “good games” and sporadic funny jokes, incivility and immature insults (often said by thirteen-year olds) are the norm. Some people are able to get past the derision and enjoy the game— if they found virtual capture the flag enjoyable in the first place—but a lot of people leave the online gaming scene with a bad taste in their mouth. Still, I’d be lying if I said there wasn’t something oddly addicting about gaming online. Maybe it’s the cartoon violence, maybe virtual capture the flag really is all the fun without any of the movement. Either way, once you’ve played online it’s hard to ever completely leave. That being said, it would still be nice to play an online game without being repulsed by the people, mechanics or wash-rinse-repeat gameplay. Now, it might be because I haven’t played online in years, but one game seems to show promise in a sea of disappointment—Paladins: Champions of the Realm. Paladins is like a refreshing change of pace after years of religious World of Warcraft gameplay, because it is a delicious hybrid of several gameplay mechanics and works amazingly well for the platform. Right now it’s currently only in Beta, meaning that it’s not out out. You can buy a Beta key that comes with a ton of perks and in-game cash, but if you’re a broke college kid shelling out $20 for fake money can feel a little dumb. The solution? Save some face and make Internet friends who’ve already got the game. Once you’re in, you get several Beta keys that you can just give away to people for free. That’s it—that’s all it takes. After that, download the video game and wait patiently for Paladins to grace the presence of your PC. After waiting several excruciating hours for the game to download and patch, you can finally play. Unfortunately, the problem with any game is that you don’t know how to play at the beginning. To make matters worse, online games infamously forgo teaching you how to play on-screen. Nope, you have to figure that out yourself. To be fair, there is a game type where you only play against bots—champions controlled by a computer—so you can figure out the mechanics there before flinging yourself into the ring with other players. If you’re lucky (like I was), you’ll have somebody to backseat drive the first few times you play. If you do, your mentor can explain what to do and when to do it. And while I would love to sit here and explain how to play, Paladins is the kind of game that’s fun to learn, even with a backseat gamer. What I will say is that no champion is created to be the same thing in a different-colored leotard. Instead, each champion has a set of skills that makes them a unique type of fighter. If you’re familiar with League of Legends, it’s a similar champion concept. Some of the champions are healers, others damage dealers and some can take a lot of damage before dying. Whichever strikes your fancy, there is sure to be a champion for you. Like the champion selection, Paladins incorporates a lot of elements that have worked for League of Legends, such as attack roster (aka deck) building and working up to more powerful attacks every time you play. You start from square one each time, so it’s not like anybody is going to jump out from behind a rock and kill you with equipment you could only dream of attaining. (They’ll still jump out at you, but at least they aren’t overpowered.) Think back to your Yu-gi-oh or Magic: The Gathering days when you reorganized your pool of cards and picked out your best build. It’s the same concept, just online. You can besiege an enemy base by fighting over siege weapons, struggle to survive in a constantly-shrinking sudden death arena or play a slightly shinier version of capture the flag. The game types have enough variety to keep you entertained, but not too much to overwhelm you with choices. Even better, the variety tends to give you an edge depending on what kind of player you are, meaning if you’re bad at one you’re probably good at another. But because Paladins wouldn’t be an online game without half-assed harassment, I bet you’re wondering about how terrible the community is. Besides the unavoidable “pull your own weight” comments, everyone is generally having a good time. Whether the conviviality results from the product being Beta or the type of people Paladins attracts though, still remains to be seen. As a Beta, one thing gamers could count on was the presence of kinks. Luckily, Paladins has a responsive development team and Beta comments section to figure out how the game can improve. If one champion is too powerful or there needs to be a new game map, you have a place to voice that opinion and be heard pretty quickly. Maybe that’s the beauty of an online game in Beta. Regardless, Paladins: Champions of the Realm is worth a shot, even if years ago you swore off the bad habit of online gaming.